Our biggest departmental news of the summer is that long-time department member Joe Novak officially retired on August 1. Joe Novak in his office. Photo by Vicki Brett. Our chair Dave DeVidi writes, “Joe completed his PhD at the University of Notre Dame in 1977, writing a dissertation entitled Aristotle on Method: Definitions and Demonstrations. He joined the Waterloo department in 1984, having resigned from a tenured position at St. Thomas More College at the University of Saskatchewan in 1983. He served for two years as Chair of the Thomas More department. At Waterloo he was the Associate Chair for Graduate Studies for several years in the early 1990s, and he served as Acting Chair in 2009-10. “Joe was always in demand as a graduate supervisor. 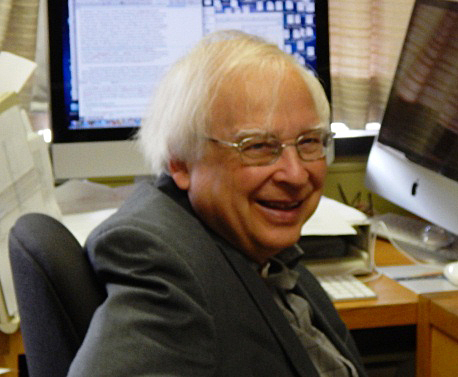 While he was hired into a department with a significant focus in the history of philosophy, the direction of the department changed over the years, so the number of PhD theses Joe supervised was not large. But he supervised well over a dozen PhD research areas, and many MA theses and research projects. Students who worked with him described him as an “incredibly resourceful” supervisor who cared deeply about the success of his students and, going back to pre-Google times, as a “walking library catalogue” when it comes to Aristotle. “In recent times, Joe has carried much of the department’s undergraduate teaching load in history of philosophy, especially ancient philosophy. These courses consistently received solid reviews from students. But perhaps Joe’s best loved course was Phil 208: Philosophy Through Science Fiction. The course was Joe’s own creation, first offered two decades ago. It introduces perennial philosophical questions to do with the nature of knowledge, mind and body, ethics, logic and language as they arise in classic works of science fiction—what’s not to love about that? “Joe’s research has primarily been in ancient philosophy, though as good history of philosophy tends to do the lessons learned in those investigations have allowed him to also contribute in other areas. Much of his early work involved investigating the ways in which the philosophical views of Plato and Aristotle depended on the developments in the mathematics of their day. An admirable feature of the work is that Joe did not shy away from doing the math necessary to do this work well—for instance, by solving some of the geometric puzzles posed by Socrates in the dialogues he was able to show previously unremarked ways in which the solutions illuminate the philosophical arguments in the dialogue in question. This expertise on the technical presuppositions of and work by important ancient philosophers placed him well to weigh in on the work of philosophers from other historical periods, such as Franz Brentano, who offered their own accounts of the work the ancients. The boundary-breaking nature of his work resulted in it appearing not only in venues such as the History of Philosophy Quarterly, but also in the Notre Dame Journal of Formal Logic and the Australian Logic Teachers Journal. In recent years, his work has turned more towards ethics in the ancient and medieval periods. In the meantime, Thank You, Joe, from all of us! Exciting news: Paul Simard Smith succesfully defended his PhD dissertation, Logic in Context: An essay on the contextual foundations of logical pluralism, on Monday, August 26! His supervisor Dave DeVidi says, “In the dissertation, Paul develops a novel account of logical pluralism that, he argues, avoids the problems that bedevil previous versions of logical pluralism in the literature. He then investigates some “downstream” implications in other areas of philosophy, such as epistemology and argumentation theory, if logical pluralism is true. The examining commitee included external examiner Martin Montminy of the University of Oklahoma, Ken Hirschkop of Waterloo’s English Department, and Doreen Fraser, Tim Kenyon, and Paul’s PhD supervisor Dave DeVidi, all of Philosophy. Many of the questions at the defence circled around a challenge that also confronts versions of pluralism in many domains besides logic—why regard participants who seem to be disagreeing about a claim as actually doing so rather than merely using the same words to express different propositions? That is, why talk of pluralism rather than ambiguity? Paul defended his view well. By the end it was clear all around that with the way his work spills over from philosophical logic into philosophy of language, epistemology and other areas of philosophy, the thesis is the start of a promising research program.” Congratulations, Paul! Chris Eliasmith was on CBC Quirks & Quarks radio show about “Building a Brain.” Some other recent press about Chris’s work is here in the The KW Record: UW prof teaches readers how to build a brain and here in the Biomedical Computation Review: Behind the Connectome Commotion (section on Simulating a Human Connectome: Spaun). Ben Nelson wrote an interesting blog post about his experience at the World Congress of Philosophy in Athens, at Talking Philosophy: The Philosophers’ Magazine Blog. (If that link has problems it’s also here). 1. The PGSA held its annual Spring BBQ at Waterloo Park on Saturday July 27th. Although the weather was a bit damp for a summer day, we had excellent company and a great time. Thank you to everyone for bringing potluck items and for joining us that day! 2. The PGSA’s Ashley Keefner has done a fabulous job at taking the initiative to create a new UWaterloo PGSA Facebook page – and it looks amazing! This page is a resource for incoming graduate students to ask questions to the current grad students. We look forward to welcoming the new graduate students soon! The new page will also feature PGSA updates for events and serve as a source of communication for grad students. Excellent work and a huge thank you to Ashley! Patricia Marino, “Moral Coherence and Principle Pluralism,” in The Journal of Moral Philosophy. This paper develops and defends a conception of moral coherence that is suitable for use in contexts of principle pluralism. I argue that, as they are traditionally understood, coherence methods stack the deck against pluralist theories, by incorporating norms such as systematicity—that the principles of a theory should be as few and as simple as possible. I develop and defend an alternative, minimal, conception of coherence that focuses instead on consistency. School starts in two weeks, so there’s sure to be more news soon. Thanks for reading! And keep in touch!